Before one of the summer ball games at Fifth Third Ballpark, while I passed some time thumbing through the Whitecaps Program, it hit me as hard as a pop-fly into the stands: Almost every ad in the program was from a West Michigan company or organization. Some of the advertised companies were big, some small, and some did tout national brands (with the exception of a structure, location, employees, and interests in the Grand Rapids area). I actually didn’t have to take a ball to the head to realize the value before my eyes. Let’s take a look together at print and sponsorship as a marketing strategy. 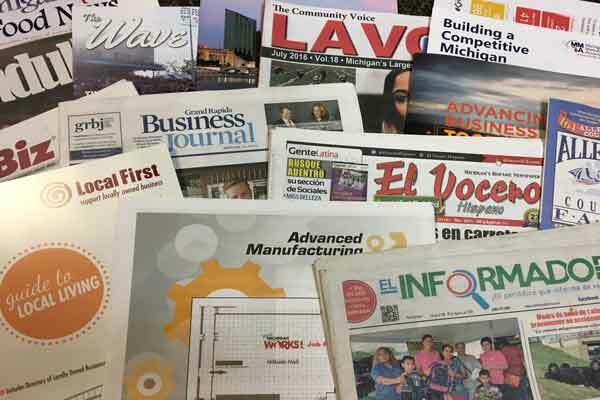 When you consider your audience, timing, offer, and cost while analyzing your media options, you just might find a perfect fit in a print publication. Be sure to read to the end for a little bonus offer from TIS, just for sharing some of your experience with us. After evaluating these criteria, if you decide that print advertising and sponsorships are the right strategies for your business, then it's time to start researching local organizations to fulfill this strategy. That being said, do not just jump at a discounted offer without taking the time to research and strategize beforehand. Use all the tools at your disposal and think strategically on your purchase. Timing: Does the publication correlate to your seasonality, weekly or daily happenings of your organizational objectives? While there are some challenges to the world of print, there are also some significant advantages to consider. For instance, print allows you to reach geographically relevant and interest-based audiences that fit perfectly with your target audiences, allowing you to engage intimately with the people who impact your business the most. For the audience, print's ease of use cannot be underestimated. A print ad or sponsorship is easily-recognizable and well-understood as long as your message is on-point and your brand is succinct. There is no need for the user to click, sign up, or commit to another action beyond recognition, understanding, and intent. One of the most desirable outcomes of print publications is its tangible nature. The opportunity for the user to hold onto the publication and refer back to it is something that's not easily done online. A person may bookmark your page or keep a tab open as a reminder, but it's much easier to hold onto a newsletter than it is to keep a page open on your browser without accidentally deleting it. A majority of the companies that advertise in local publications are also local. Before committing to advertising in a publication, consider this: Your ad means you also support that organization. For example, a sponsorship of the Forest Hills Fine Arts Center means you are also supporting the Forest Hills Public Schools Fine Arts Center and the artistic growth and enjoyment of area youth, families, and seniors in that area. On the surface, supporting local businesses through your print ad or sponsorship program may not seem like it would have a huge economic impact, but it actually really does. Local First tells us that $68 of every $100 spent at a local business stays in the community to pay wages, taxes, new products etc., whereas $100 spent at a national chain only keeps $57 of that money circulating in the community. 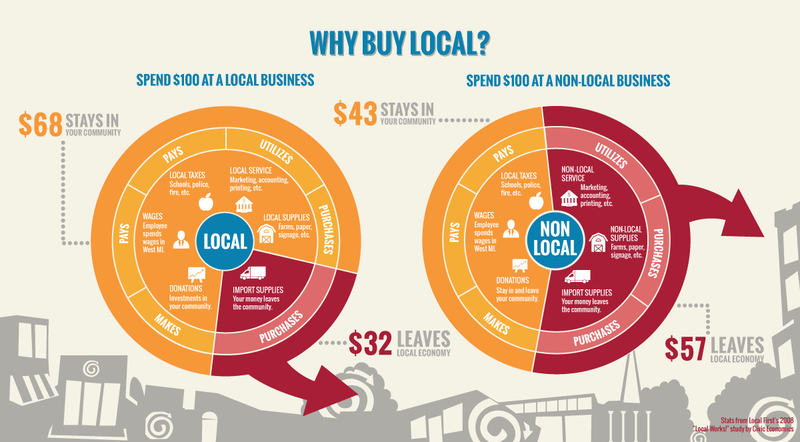 Learn more about the benefits of buying local in this infographic from Local First. What are your favorite publications? We need your help! The opportunities to reach your targets are out there. As your brand marketing ally, TIS is your go-to resource for finding print or sponsorship opportunities that meet your needs. Keep an eye out for an awesome resource we're working on for 2017—a Local Publication Guide containing advertising and sponsorship opportunities in the metro Grand Rapids area. This is where your input really comes in handy! What print publications have brought you success? Share them with us along with a short explanation about why they're an important asset, and we will send you our free compilation of print publications and sponsorships once completed! Click here to submit your recommendations. Bonus: Submitting your favorite local publications will also enter you in a drawing for a chance to win a $50 gift card to the local restaurant of your choosing! We need your responses by October 14 to be eligible and we will draw the winner October 17. Winners must choose a restaurant that is locally owned in the GR area. Good luck and Thank You!